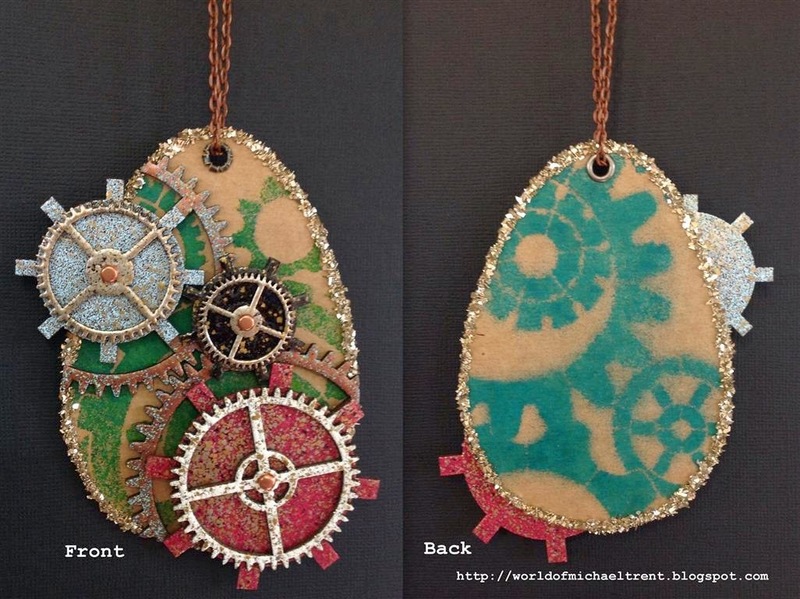 I have to admit that I am NOT a "Steampunk" person. I do love doodads and whatchamacallits. To collect. In a drawer. Or glass jar. To admire. 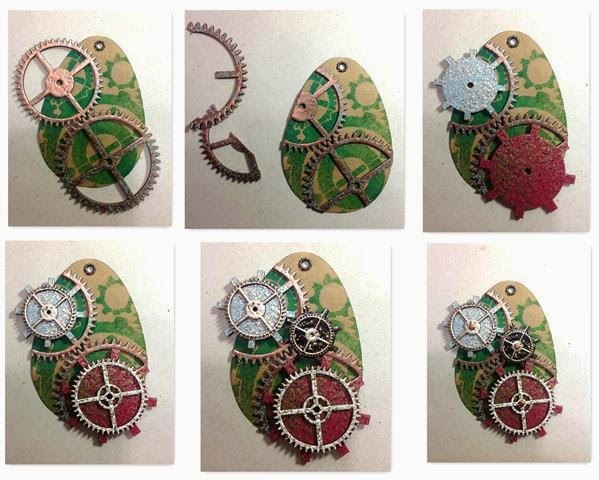 This project started because we sell these chipboard gears in our store and they had been whispering in my ears for weeks! I just had to use them. We had also just gotten in a shipment of embossing enamels from Stampendous and I wondered how the chipboard would look with the enamels. So I started to play. I have no idea what part of my brain this project came out of but I really love the end result. The ornament is about to take a journey across the ocean to a very special person in New Jersey that loves Steampunk!! I hope Toniann Carbone loves admiring it as much as I loved making it for her!! 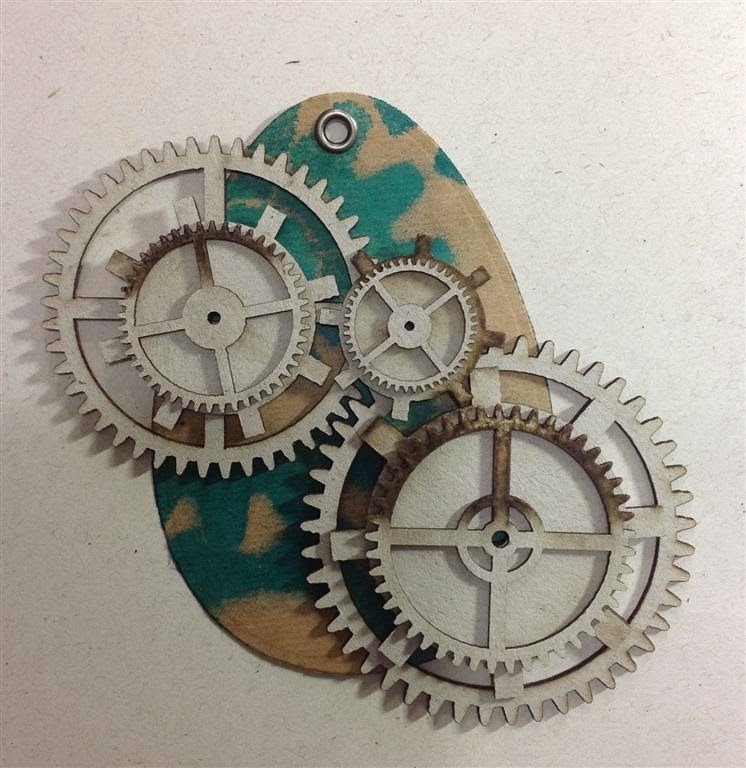 Although the gears I used in this project are made by a Brasilian company, and I was on the fence about whether or not to post this step by step. But, since there are plenty of companies out there probably making something like these gears, I went with it. If you really want or need these, just shoot me and email and we can figure out a way to get them to you. Or...maybe I will just add them to my Blog Candy. 1. 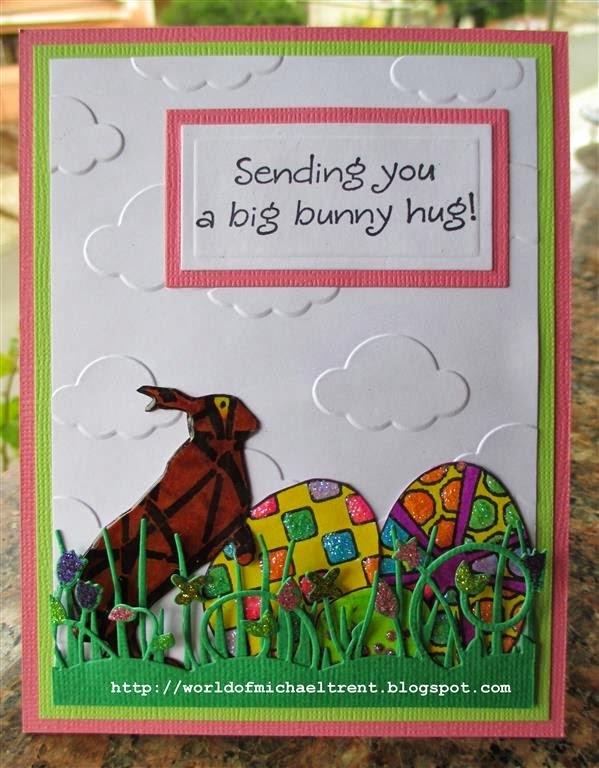 (A) Die cut and emboss the largest of the Easter Egg dies using a die cut machine and the 140lb cardstock. (B) Lay the Gears stencil over the egg and spray the part of the stencil that you want to see. Using a paper towel, roll it over the spray to remove excess ink. (C) and (D) Do this on both sides. I used a mixture of Calypso Blue and Fresh Lime Dylusions Ink Spray on one side and just the Calypso Blue on the other. (E) Make hole for eyelet using a Big Bite or other eyelet setting tool and set eyelet. 2. 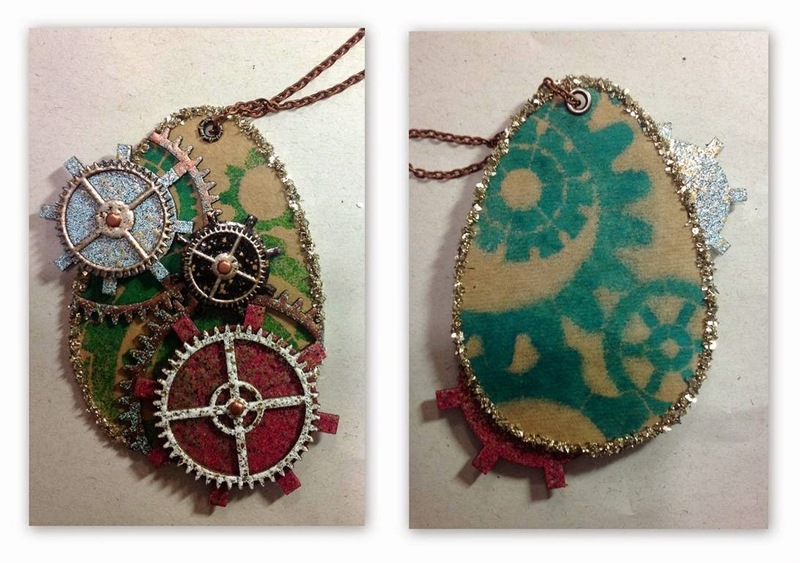 Using the chipboard pieces you have, play around with them, move them around the egg, until you get the look you want. In my case, I wanted a few layers of different designs and sizes. I went with the largest on the bottom with the smallest on the top. The photo below shows how I want to arrange my pieces after I emboss them. They are not yet glued down. 3. Now to emboss. Using a Versamark Ink pad or another embossing ink pad, get each piece very wet. Then pour one of the embossing enamels over the whole piece, remove the excess powder, and then heat emboss with the Ranger Heat Gun. I prepared each piece and set aside. Then I went back and heat set them all at the same time. Also, for the solid pieces, I used embossing enamels on both sides because I knew the other side would be seen from the back. 4. Now to glue the pieces down to the egg. Using Glossy Accents or Diamond Glaze, apply DABS on the back of each of the base pieces and glue to the Egg front. When dry, turn the egg over and trim the pieces with a good scissor so they are not hanging off the egg (save these pieces for another egg). Then apply the next two layers with the Glossy Accents. But do not trim these layers. When all your layers are glued down, put some glossy accents in the holes in the top pieces and slip a copper brad in each of the holes. 5. Apply Glossy Accents around the front rim of the Egg and then pour the Champagne Crushed Glass Glitter. Remove excess and put back into the bottle. Set aside and allow to dry. Then do the back side. Slip a copper or other chain through the eyelet and you are ready to hang this up for all to enjoy. This would also make an amazing Christmas Tree Ornament!! 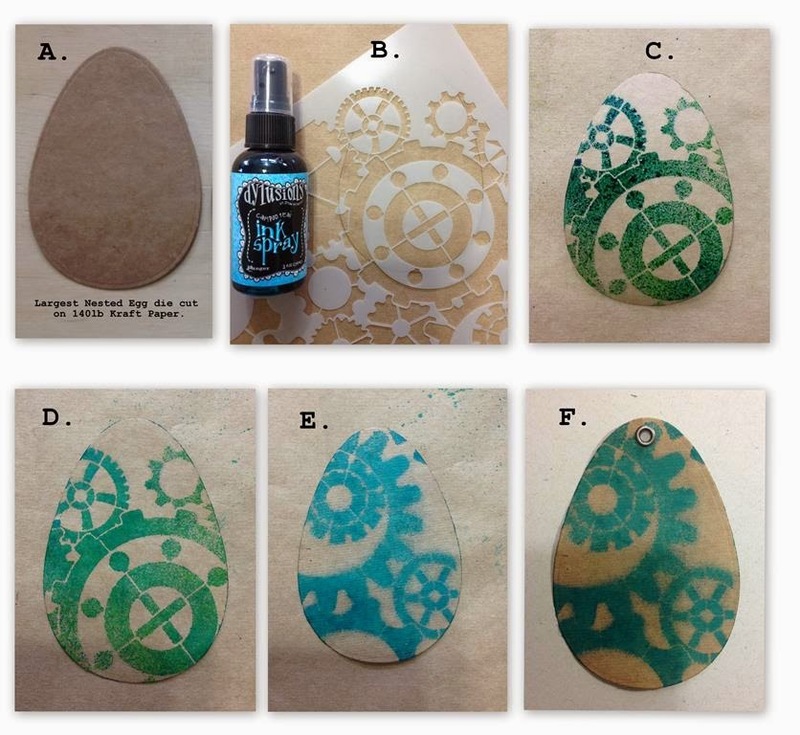 StencilGirl Talk Today - StenDoodled Easter Eggs!! Hey everyone. 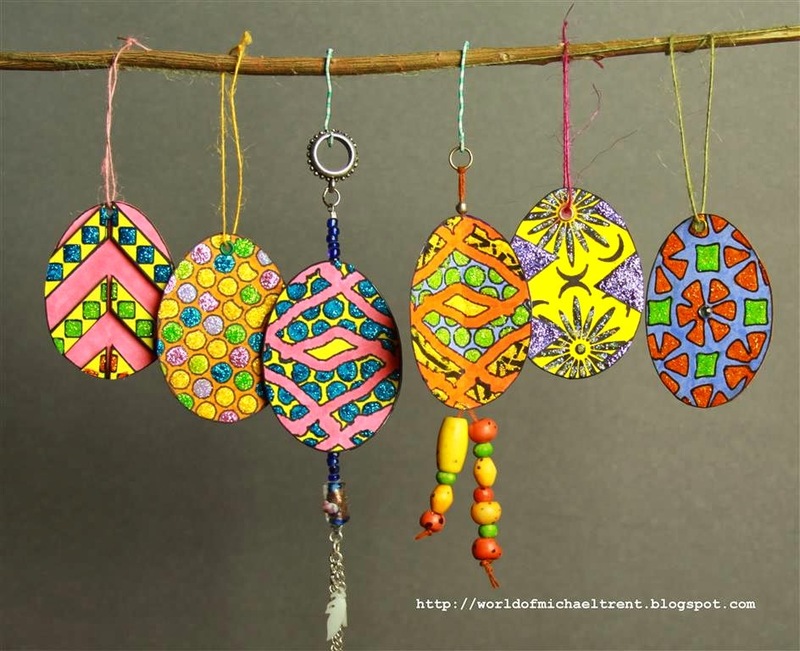 Today I have a beautiful StenDoodled Easter card on StencilGirl's blog. Hope you can stop by and check it out with my usual step by step tutorial!! Just head on over to - HERE! Hey everyone. One of the first stencils I bought from StencilGirl was the Weaving Stencil by Andrew Borloz. I loved it because all I really saw were candles. And candles can always be used on cards. This is a project I have had in my head for some time and I finally found some time this week to get them done. As you can see from the photo below, I made two birthday cards mixing a die cut from Memory Box with Andrew's Weaving Stencil from StencilGirl. The tutorial is for the card on the left and the card on the right is a more feminine option with different colors and the candles done differently too. White cardstock 5 1/4" x 4"
Green cardstock 5 1/2" x 4 1/4" and another piece 1 1/2" x 4 1/2"
Purple cardstock 2 1/2" x 5 1/4"
1. Adhere the Green cardstock (5 1/2" x 4 1/4") to the card front using double sided tape or an adhesive of your choice. 2. 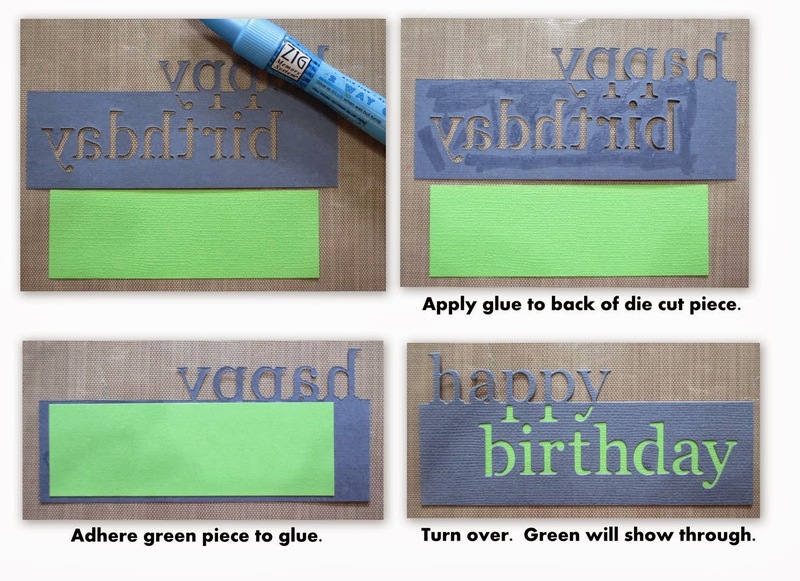 Adhere the Happy Birthday die from Memory Box to the piece of purple cardstock with the removable tape and run it through your die cut machine. Note: don't throw away the letters that will cut spelling "birthday". Keep them for another project. 3. Turn the die cut piece over. Apply some of the Zig Chisel to the back where the green piece will go and adhere the piece of green cardstock. 4. Apply some double sided tape to the back of the piece and adhere to the piece of white cardstock. 5. 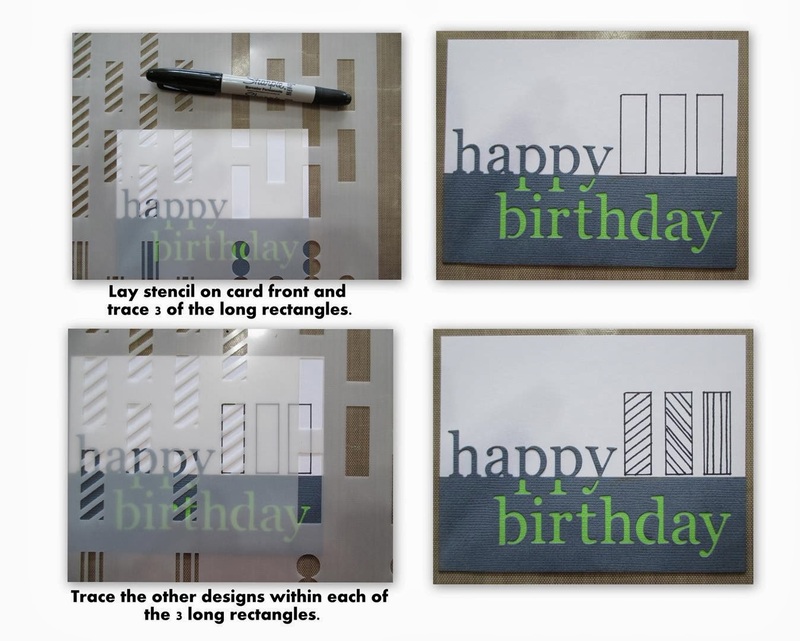 Using your black permanent marker, trace 3 of the long rectangle design in the stencil to the card front. Then go back and trace the other designs within each of the 3 long rectangles. For the middle candle, I put the design on the side and traced. 6. To make this look like a candle, you need to have a flame. I did not have just a candle flame stamp so I used a stamp positioner and a sticky note to place the flame at the top of each candle. 7. Color the candles and the flames. I used Tombow Markers, Nos. 025, 055, 195, 493, 835, and 925. After coloring, adhere this piece to the card front using double sided tape or adhesive of your choice. 8. Adhere the Stickles over the Tombow Markers and allow to dry. I used markers and Stickles close in color so they would compliment each other. After they dry, you can use the permanent marker and trace back over any areas that need to be darkened. 9. Write a nice message inside and send this card to someone special.